Libyan UN Rep, Told of a Security Council Trip, Tells Press There's No "Need for Them to Visit"
UNITED NATIONS, December 2 -- After a possible Libya trip by the UN Security Council was first reported by Inner City Press on Friday morning, by Friday afternoon cold water had been thrown on the idea. 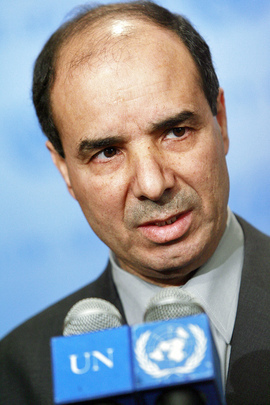 Inner City Press asked Libyan diplomat Ibrahim Dabbashi about the idea of a trip to Libya. "I don't think there is any need for them to visit," Dabbashi told Inner City Press. He added that "personal invitations" might be made - but that wouldn't be a formal Council trip. The Council's president for December Vitaly Churkin of Russia, when asked by Inner City Press about the closed door discussion during his mid-Friday press conference on the month's program of work, confirmed that Libya was a country discussed, among others, with a first trip tentatively scheduled for mid February. Sources told Inner City Press that the UK raised the possibility of a Council trip to Egypt, to visit the Arab League, and to Libya. The latter may now be removed from the table. The representative of another permanent Security Council member, when told by Inner City Press what Dabbashi had said, indicated that for a Council trip to take place, they have to be welcome and invited. At times, Sudan has been less than welcoming, for example when the Council wanted to go to Abyei in May 2011 before South Sudan's independence. On the other hand countries like Liberia with UN peacekeeping mission seem to like the Council to visit. Libya, if Dabbashi's comments are the judge, is somewhere in the middle. After some distaste at Ian Martin's plan for military observers -- obtained and published by Inner City Press, and panned by the then Benghazi based TNC -- Libya has agreed to the UNSMIL mission, which is (very) slowly staffing up. But as to the Security Council itself, Dabbashi said, "I don't think there is any need for them to visit." Watch this site. by said. Not as much as we'd like to. Watch this site.